People are changing. New York is changing. Luxury is changing. 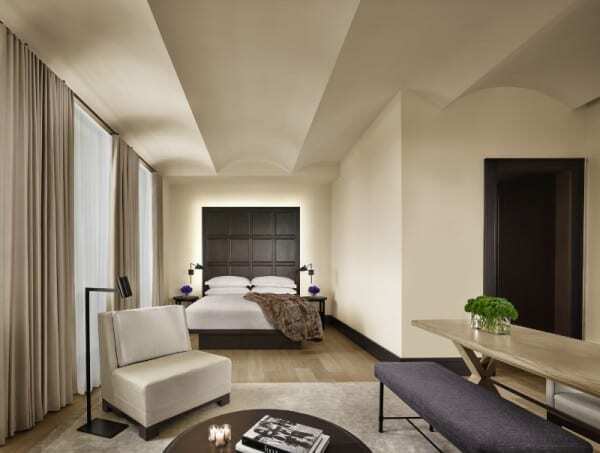 With The New York EDITION, Ian Schrager and Marriott International respond to this changing landscape by introducing a new luxury for a new generation. Until now, the idea of a modern luxury hotel was an oxymoron. Luxury hotels, except for a few rare exceptions, were traditional in design by definition — the more luxurious a hotel was, the more traditional looking it was expected to be. Ian Schrager and Marriott International recognized that this safe approach and “give no offense” design philosophy was itself an offense. Again, except for rare exceptions, luxury hotels continue to be predictable. A new generation that has grown up in the age of technology, social media, instant access, the proliferation of global consumer brands, affluence and conspicuous consumption has long craved an alternative. Many people’s priorities have changed and so have their needs and desires. Luxury for them is no longer about traditional status symbols, outdated notions of luxury or how much something costs. They simply desire an elevated experience and one that makes them feel good. And, they desire a hotel that is steeped in simplicity, refinement, sophistication, good taste and restraint, but is at the same time, just as striking, glamorous, exciting, surprising, joyful and memorable. It is this fusion that creates the uniqueness and distinction that people have come to expect from Ian Schrager and EDITION. Today’s modern travelers, more connected than ever due to social media, are now hungry for community and social interaction in the physical world, not just online. They seek to surround themselves with likeminded individuals with common interests, views, aesthetics, tastes and desires. Schrager and Marriott have provided this new generation with the alternative that speaks to the way they live and travel today, which are now one and the same. This new luxury is also the luxury of simplicity. The challenge however lies in the fact that it is difficult to do “simple”, and to do it well. Yet, a quiet, edited, refined approach speaks volumes louder than the “look at me” design that is so prevalent today in a time of a one-upmanship mentality. The New York EDITION evokes a new age of American Glamour — an understated, timeless aesthetic that is incapable of being categorized or defined in textbook design terms. The New York EDITION pays more than lip service to being a home away from home. It is truly a “hotel as private home”. Inspired by New York City’s turn of the 20th century private clubs, Fifth Avenue’s Gilded Age Mansions and Stanford White’s architectural masterpieces, the hotel’s residential feel will instantly draw guests in, and the hotel will serve as a refuge in the city and from the city. It is akin to staying in the guest room of a private home, rather than a hotel room. Despite the inherited pedigree of this building, it was essential that the interiors were infused with a modern, sophisticated design vernacular. Not unlike what was achieved with The London EDITION by giving a modern twist and punk touches to the likes of a traditional, aristocratic English country estate and the quintessential London private gentleman’s club, The New York EDITION will possess a similar fusion of old and new. “I’m always interested in upsetting the status quo and going off in new directions. Combining opposites and unexpected surprises has always been fascinating to me. When two opposing aesthetics come together, they either fail miserably or create alchemy. If done well, the presence of one will always serve to showcase the other. It takes the experience of staying in a hotel to a whole new level and the end result is impossible to categorize,” Schrager says. The New York EDITION makes its debut in the world-famous, iconic “Clocktower” building, otherwise known as the Metropolitan Life Insurance Company Tower. The building was designed by the architectural firm of Napoleon LeBrun & Sons and completed in 1909. At the time, it was the tallest building in New York City until the Woolworth building opened in 1913. It is situated on Madison Square Park in a neighborhood of the city referred to as NoMad. The restaurant, on the second floor overlooking the park, is where the subtle play of modern and period design continues in new forms. Three intimate dining rooms, a parlor with a billiard table and a library serving cocktails, after dinner drinks and dessert, are separate as in a private home, but come together seamlessly to form a whole. Drawing from over four centuries of art and design, the rooms feature original herringbone oak floors, original mahogany wainscoting on the walls, and a restored Venetian plaster ceiling. The velvet chairs and banquettes, upholstered in rose, green and blue, are inspired by the vibrant colors of the Dutch masters, notably Vermeer. Each of the three dining areas has a large chandelier by modernist designer Eric Schmitt. They are made from three black iron arms that support a 7ft diameter ivory plaster ring. Above the lobby and the restaurant are the 273 guest rooms. Guests enter into a dark oak wood paneled foyer, much as they would if they were entering an upscale New York apartment in the 1920s. The rooms are serene, comforting and feel like an oasis from the outside world. There is visual drama, too. The original windows in each room perfectly frame the New York City skyline. Many of the suites have 180-degree views of Manhattan and the 1,400 square foot penthouse apartment has 360-degree vistas. Each room has a classic, extra long and deep floating white oak desk, inspired by Jean-Michel Frank, and a bed with a dark walnut headboard and a custom-built walnut platform with bespoke walnut nightstands. Travelers’ tastes are changing when it comes to service, too. The EDITION brand has responded to this change by offering modern service that is accessible and gracious, charming and attentive, but not familiar, where the staff treats guests as an individuals knowing just when to offer to help and just when to get out of the way. It expels traditional obsequious and pretentious service that today’s travelers are no longer interested in. EDITION creates the right service infrastructure to enable these travelers to do what they want to do, whatever it may be, whenever. One example can be seen with dining options. EDITION restaurants and room service offer the finest rare cuts of beef and wild Atlantic salmon, if that’s what guests want. But if a guest prefers simple pasta with tomatoes and olive oil or a burger, those offerings will be available, delicious and won’t break the bank. The New York EDITION, like every other EDITION, is a custom-made one-off hotel that is authentic and modern, and yet feels very personalized and individualized. It is of its place and of its time and unlike any other EDITION before it or to come. With a New York hotel finally launching and global expansion plans, it is evident that the Schrager/Marriott International partnership seeks to not only have the biggest impact, but to have the best hotel product possible. So far, so good.